Endospore staining by Bartholomew and Mittwer's method. To stain Endospore of a bacterial cell by Bartholomew and Mittwer’s Method. Cell suspension of endospore producing bacteria. Take a clean grease free slide and prepare a thick smear on a slide. The smear is heat fixed by passing the slide from the flame for about 25 times. The slide is allowed to cool. Further the slide is treated with Malachite green stain and allowed it to react for about 10 minutes. After 10 minutes slide is given a water wash treatment. Further the slide is treated with counter stain that is saffranin for about 30 seconds. After 30 seconds the slide is water washed, air dried and observed under oil immersion. 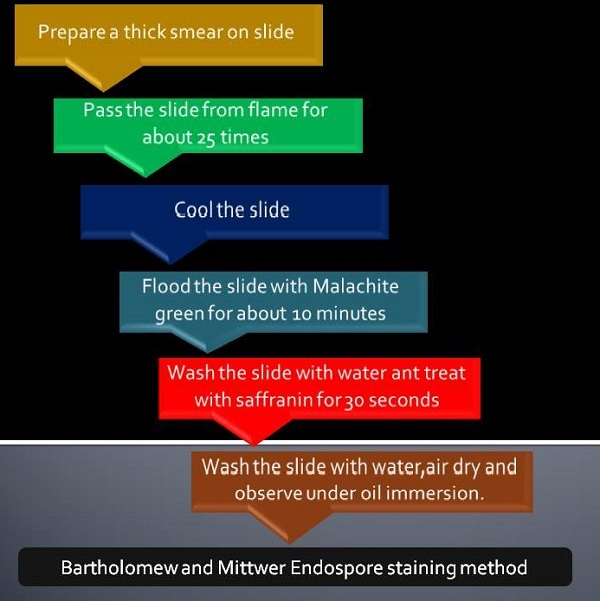 Flow chart of Endospore staining by Bartholimew and Mittwer’s Method. Here in these staining technique we apply a longer heat treatment and prolonged staining technique. Endospore get stained due to longer heat treatment,prolonged staining and heavy concentration of stain. here we pass he slide from flame for about 25 times in addition we use concentrated stain that is 7.6 % Malachite green for about 10 minutes. This technique stains the cell as well as the endospore. When we give water wash treatment the water acts as a weak decolourising agent and decolourises cytoplasm and not endospore. So here further we apply a counter stain that is Saffranin . Due to application of saffranin the cytoplasm gets stain in pink colour. After staining procedure the endospore appear green in colour as well as cytoplasm appear pink in colour.